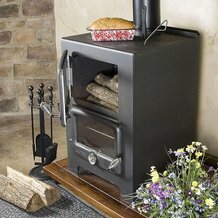 The Vermont Bun Baker combines the essential functions of a classic wood stove and cookstove in one compact, attractive package. 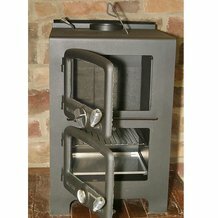 Its extremely versatile design enables you to effectively heat a large area (up to 700 sq ft) and cook your family's meals with one unique stove. The Vermont Bun Baker is exempt from EPA regulations. 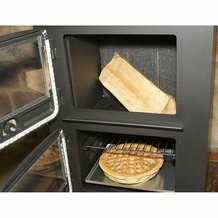 Best, most versatile wood stove I have ever used. Enough cooking surface for my #10 griddle or my 36 qt canner. The oven bakes everything from cheesecake to pizza. An amazing heirloom quality tool. We would appreciate more bakeware sized to fit the oven though. We need more cookie sheets! I love this stove! Easy to heat and cook with! This stove is great. We have been heating our house all winter with it and it works great. We love this stove. Have used this stove for the first winter, and it works as advertized. Heats the main floor of under-insulated 1930's house (1000 sq. ft) completely in all but coldest Canadian winter temps. Simple, elegant design; modern, clean look. Burns much more efficiently than old Enterprise of my youth. Firebox a bit small. Too early to say about durability, but very few moving parts to break. Throws off plenty of heat, boils water, oven roasts nicely. Baking requires some practice, but possible. We are enjoying our Bakers Oven wood cook stove. We re new to the wood stove lifestyle, and so it was with great caution that we made our first fire. This stove heats the new addition of our home very nicely. I slipped in a pan of chocolate chip cookies on my first cooking attempt and they were successful. I was so inspired that I baked a home made pizza! It will take a bit longer to prepare food this way, but I have enjoyed the process. Since we are a total electric house, it is reassuring to know we will have heat and a method of cooking should we lose electricity. This is a great stove. We use it to heat our whole house in winter, plus, we get to cook on it! The only problem, is when my husband fires up, he gets it too hot to be able to bake in it. The oven thermometer isn't very accurate, so, we bought an oven thermometer for baking temperature.